Whilst developing the year-long project the artists have spent time in residence with Metal and worked closely with Chalkwell Park’s gardeners, one of whom (recently retired) inspired the title and concept for the artwork. He grew up a punk and now imagines creating and naming a rose ‘Spiky Black’ in memory of his youth. The 100% black rose is notoriously impossible to breed and though countless attempts continue to be made it remains an enticing and enigmatic idea. Working with the words of rose growers from around the UK including Peter Beale’s rose nursery in Norfolk, Spiky Black playfully shifts register from the pragmatic to the poetic, incorporating language sourced from punk bands, historic rose catalogues, horticultural terminology and first person interviews. It provides a transformative audio layer to the rose garden experience, giving listeners an intimate and alternative insight into the thoughts and language of those committed to growing roses. Designed as a series of short tracks, the audio work can be accessed by visitors to Chalkwell Park via their mobile devices at www.netpark.zone using the free NetPark wi-fi. A supporting website will provide more information about the work and additional interviews and videos. 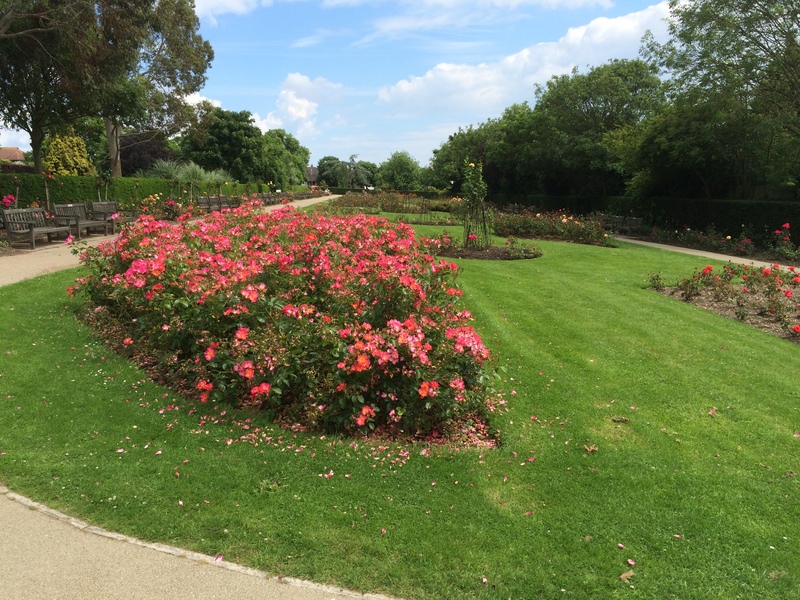 The Chalkwell Park Rose Garden has been one of the finest Rosaries in the country and its proud history has been recorded by Jim Sanctuary, president of Leigh Horticultural Society alongside the story of the celebrated local Rosarian, Walter Easlea (Easlea’s Golden Rambler, 1927). Jim has provided valuable expertise and insight to Carlier and Loomes throughout the project and in an exciting development Leigh Horticultural Society have sponsored the replanting of one of the rose beds with Royal William roses and to re-introduce the Easlea’s Golden Rambler into the park. Working in collaboration for the first time, Carlier and Loomes say that they have “hybridised their practices to develop an experimental documentary audio drawing”. Alison Carlier completed an MA in drawing at Wimbledon College of Art in 2013 and went on to win the Jerwood Drawing Prize (2014) with her open ended audio drawing ‘Adjectives, lines and marks’. She has gone on to have solo exhibitions at Hardwick Gallery, Cheltenham (2014) and m2 Gallery, Peckham (2016). Her work was selected for Emergency 7, Aspex, (2015) and for a new work ‘Tonal Observational Drawing’ at The JHB Archive, Birmingham Open Media, (2015). She gave a performance at Art Language Location, Cambridge (2015) and in 2016 became the Alexandra Reinhardt Memorial Award Artist in Residence at Aspex, Portsmouth resulting in permanent commission for the gallery. Amanda Loomes has been making experimental digital documentaries since graduating from The Royal College of Art (2006) including a number of works funded by Arts Council England such as ‘Equivalents I-VIII’, 2010 and ‘Multi-story’, 2014, which subsequently won South Central Open. In 2013 she was short-listed for Jerwood Open Forest working with Forestry Commission England and the work was shown at Jerwood Space (2014). In 2015 Loomes was co-commissioned by HOUSE & Photoworks and developed the film installation ‘Relict Material’ exploring the marine aggregate industry. Last year she undertook a National Trust commission at Lyme in Cheshire working with the past and present ‘Keepers’. In 2015 she was selected by Metal to attend a weeklong development LAB in Southend that has resulted in Spiky Black. The inaugural meeting of the Leigh Horticultural Society was held on Thursday, 4th June 1925, at Elm Hall (now Leigh Community Centre) under the chairmanship of Mr Cranley Perry, a keen local gardener who lived in Vernon Road. At the time, Leigh was undergoing rapid expansion, with large housing estates being built on countryside that had hitherto been farmland. New home-owners were eager to grow flowers and vegetables on their virgin plots and many were quick to join the fledgling horticultural society. An early event was a competition for the best-kept garden, launched in 1926 and proving popular over many years. In the 1930s, summer flower shows were held at Chalkwell Park, featuring marching bands, dance troupes, side shows, and special events for local schools. The show benches were erected under canvas and well supported by members of the flourishing society. By the end of the decade, the LHS Summer Flower Shows had become an important feature in the town’s calendar of major events. However, horticultural exuberance was soon to be dashed by the outbreak of the Second World War. The Dig for Victory campaign was underway and the lawns and flower beds of Chalkwell Park were ploughed up for the production of vegetables, to augment the many allotment sites around the town. Leigh Horticultural Society went through a period of decline as men and women were called up to assist in the war effort. Nevertheless, within a few weeks of VE Day, the dormant society was resurrected under the chairmanship of Mr W. Finch, who lived in Oakleigh Park Drive and is thriving to this day. NetPark is the exciting new visitor attraction for Southend, created and launched by Metal in October 2015. It is a constantly evolving collection of GPS located digital artworks that present artistic responses to the landscape, people and history in the busy, well-used Chalkwell Park. Spiky Black will be the fourteenth, specially commissioned work to be sited within NetPark. NetPark also has at its heart a research and education studio, fully equipped with digital facilities at Metal Art School to enable continued artistic R&D and an education programme for young people and adults. We also run an ongoing NetPark Wellbeing Project which works with adults living with mental health issues, including those living with dementia, using digital art, developing digital skills and the outdoors. NetPark creates an added layer of thought-provoking, engaging and playful artworks to enhance the usual day out in the park, and attract new visitors to the park and to Southend.